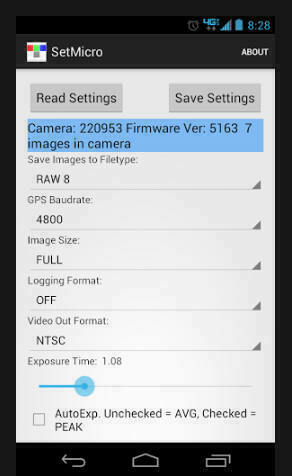 APP Description: SetMicro is a handy tool to enable re-configuration of Tetracam ADC Micro cameras in the field with nothing more than the device this app is running on. Simply place the camera micro SD card in the external SD card slot of your device and run this app. You'll see the current configuration of the ADC Micro SETTINGS.TXT file. Make any changes you need to make and click the Save Settings button. SETTINGS.TXT will be re-written with your changes. Put the card back in the camera and power it up to the new configuration! This app has been tested with Motorola Droid and Samsung handsets. If SetMicro can't find the external removable micro SD card on your device, press the button at the bottom of the about screen to write a copy of the device linux proc/mnts file. It will be written to the Downloads folder of your USB (non-removable) storage. Your email app will then start so you can send MntProcs.txt to support@tetracam.com.